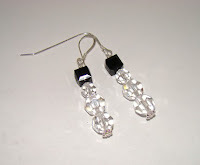 Today I'm featuring signaturesterling, another great shop filled with beautiful beaded jewelry! All the beads used are genuine (a mix of Swarovski crystals, semiprecious gemstones, Czech glass and lampwork beads) and the silver you see is sterling, unless otherwise noted. Also take a look at her line of Buckeye (Ohio State) jewelry which showcases life-like lampwork buckeye beads. I stuck to a theme while choosing items to show you (there were that many favourites!) ~ can you guess it? Christmas, of course! Starting out with this beautiful deep forest bracelet. 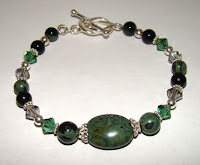 These lovely green stones are called kambaba jasper, and the bracelet also features black jasper and Swarovski crystals . A brilliant addition to your holiday jewelry collection ~ one that can be worn throughout the year. How about a bit of red? 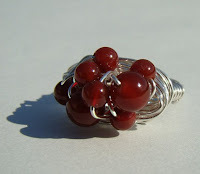 This garnet nest ring is sure to grab some attention for you. The juicy garnet berries are nestled in a sterling nest, ready for all your gift giving needs. Hmm.. personally, I don't think winter is complete without some snowmen. Without lots of snowmen. 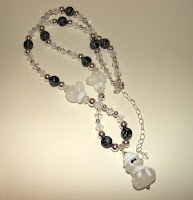 Here's a really cute frosty necklace that has a snowman pendant and some matching lampwork mittens. The beautiful frosty glass, complemented with crystals and snowflake obsidian rounds, is sure to give you chills while the cute little face will definitely warm your heart. Candy canes are another must-have during the holiday season, but instead of the sweets, you'll be craving these peppermint earrings. In a refreshing bright red, these large Czech glass beads make perfect earrings that you can wear throughout the holidays for that extra dose of cheer. While you're browsing through signaturesterling, don't forget to check out the JET holiday sale section. There, you'll find these delightful mama ice earrings, that remind me both of icicles and snowmen. Snowlady, sorry. Her hat of jet black Swarovski crystal tops off a shapely body of faceted round crystals. A simple, contemporary design that is perfect for the snowman lover (especially as a year-round piece). Oh yeah... and they're on sale!! Be sure to check out the shop announcements for important holiday deadlines ~ you definitely want these pieces before Christmas! And don't worry, there's lots more in store! Please drop by her blog too, and read about all the amazing artists in this 90 day challenge. That is a great feature! Very nicey done!